12M 100 LED fairy light multi colour (green cable) These super bright LED fairy lights can ..
7M 100 LED fairy light white (green cable) These super bright LED fairy lights can be safel..
12M 100 LED Fairy Light Blue (Clear Cable) These super bright LED fairy lights can be safely used i..
12M 100 LED Fairy Light Blue (Green Cable) These super bright LED fairy lights can be safely used i..
13M 100 LED fairy light warm white (green cable) These super bright LED fairy lights can be safely ..
13M 100 LED Fairy Light Warm White (Clear Cable) These super bright LED fairy lights can be safel..
13M 100 LED Blue And White Colour Fairy Lights with 8 Functions & Memory (Green Cable) These su..
13M 100 LED Multi Colour Fairy Lights with 8 Functions & Memory (Clear Cable) These multi colou..
14.9M 100 LED White Fairy Lights with 8 Functions A stylish addition to your christmas tree! 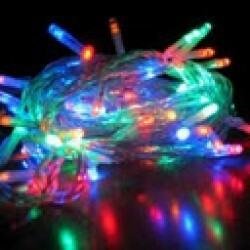 The..
17M 144 LED Multi Colour Fairy Lights with 8 Functions (Green Cable) A stylish addition to ..
19M 200 LED Blue Fairy Lights with 8 Functions & Memory (Clear Cable) These warm white LED fair..
19M 200 LED White Fairy Lights with 8 Functions and Memmory (GREEN Cable) Only 12 Boxes in this pro..
19M 200 LED Warm White Fairy Lights with 8 Functions & Memory (Green Cable) These warm white LE..
19M 300 LED Blue And White Colour Fairy Lights with 8 Functions & Memory (Clear Cable) These su..
19M 200 LED Multi Colour Fairy Lights with 8 Functions & Memory (Clear Cable) These multi colou..
19M 200 LED White Fairy Lights with 8 Functions & Memory (Clear Cable) These warm white LED fai..
24.9M 200 LED Multi Colour Fairy Lights with 8 Functions (Green Cable) A stylish addition t..
14M 200 LED Blue Fairy Lights with 8 Functions & Memory (Clear Cable) These super bright LED fa..
25M 300 LED Blue Fairy Lights with 8 Functions & Memory (Green Cable) These super bright LE..
25M 300 LED Multi Colour Fairy Lights with 8 Functions & Memory (Clear Cable) These super brigh..
25M 300 LED Blue And White Colour Fairy Lights with 8 Functions & Memory (Clear Cable) These su..
25M 300 LED Blue And White Colour Fairy Lights with 8 Functions & Memory (Green Cable) These su..
25M 300 LED Warm White Fairy Lights with 8 Functions & Memory (Clear Cable) These super bright ..
25M 300 LED Warm White Fairy Lights with 8 Functions & Memory (Green Cable) These super bright ..
25M 300 LED White Fairy Lights with 8 Functions & Memory (Green Cable) These super bright LED ..
23.9M (light length) 240 LED Green Fairy Lights with 8 Functions & Timer (Clear Cable) These ..
23.9M (light length) 240 LED Pink Fairy Lights with 8 Functions & Timer (Clear Cable) These b..
23.9M (light length) 240 LED Red Fairy Lights with 8 Functions & Timer (Clear Cable) These br..
23.9M (light length) 240 LED Warm White Fairy Lights with 8 Functions & Timer (Clear Cable) T..
30M 292 LED Multi Colour Fairy Lights with 8 Functions & Memory (Green Cable) These super brigh..
34.9M 300 LED White Fairy Lights with 8 Functions (Green Cable) A stylish addition to ..
54.9M 500 LED White Fairy Lights with 8 Functions (Green Cable) A stylish addition to y..
55M 500 LED Blue Fairy Lights with 8 Functions & Memory (Clear Cable) These super bri..
55M 500 LED Multi Colour Fairy Lights with 8 Functions & Memory (Clear Cable) These super ..
55M 500 LED Multi Colour Fairy Lights with 8 Functions & Memory (Green Cable) These super ..
55M 500 LED Warm White Fairy Lights with 8 Functions & Memory (Clear Cable) These sup..
55M 500 LED Warm White Fairy Lights with 8 Functions & Memory (Green Cable) These super bright ..
55M 500 LED White Fairy Lights with 8 Functions & Memory (Clear Cable) These super br..
55M 500 LED Fairy Light Blue (Green Cable) These super bright LED fairy lights can be safely used i..
65M 600 LED Blue Fairy Lights with 8 Functions & Memory (Clear Cable) These super bright ..
65M 600 LED Multi Colours Fairy Lights with 8 Functions & Memory (Clear Cable) T..
65M 600 LED Warm White Fairy Lights with 8 Functions & Memory (Clear Cable) These s..
65M 600 LED Warm White Fairy Lights with 8 Functions & Memory (Green Cable) These super bright ..
65M 600 LED White Fairy Lights with 8 Functions & Memory (Clear Cable) These super bright..
65M 600 LED Multi Colours Fairy Lights with 8 Functions & Memory (Green Cable) T..
75M 700 LED Multi Fairy Lights with 8 Functions & Memory (Clear Cable) These super bright LED f..
75M 700 LED Multi Colour Fairy Lights with 8 Functions & Memory (Green Cable) These super brigh..
75M 700 LED Warm White Fairy Lights with 8 Functions & Memory (Clear Cable) These super br..
75M 700 LED Warm White Fairy Lights with 8 Functions & Memory (Green Cable) These super br..
75M 700 LED White Fairy Lights with 8 Functions & Memory (Clear Cable) These super bright LED f..
75M 500 LED Fairy Light Blue (Green Cable) These super bright LED fairy lights can be safely used i..
9M 720 LED Cluster Lights - Multi Colour These Cluster Lights really make an impression! Dazzling..
9M 720 LED Cluster Lights - White Colour These Cluster Lights really make an impression! Dazzling..